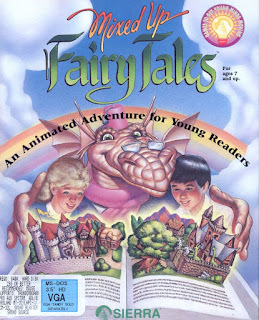 I guess you could consider Mixed Up Fairy Tales as a continuation to the earlier Roberta Williams Mother Goose game, as the idea is more or less the same in this Lori Ann Cole, better known for Quest for Glory games, helmed title. 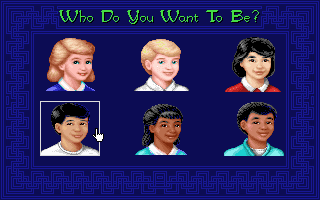 Like in the Mother Goose game, you get to choose a gender and ethnicity of the kid you want to represent you and are whisked away to a land of fairy tales, where a nasty ball-shaped gremlin has messed up the fairy tales. The keeper of the fairy tales, Bookwyrm, tasks you to help the tales to get to their respective endings so that children everywhere can keep enjoying them. Mother Goose was a game aimed more to kids under 5-years old, so it was in gameplay and puzzles, very easy game to play and get into. You had to find story-specific items and carry them to the right fairy tale people to see the rhyme unfold. 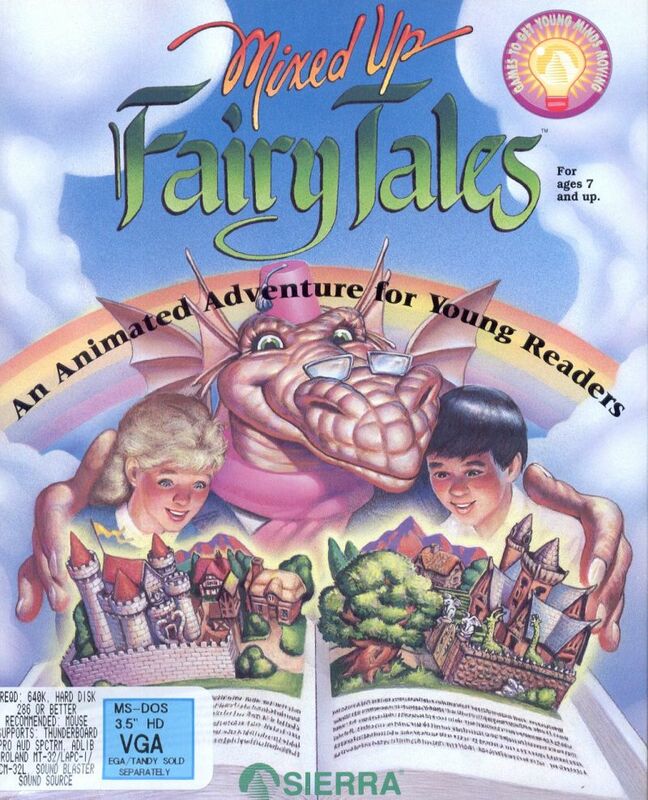 Mixed Up Fairy Tales is a bit more complex, albeit still aimed towards younger kids, from 7 up. This time you need to recognise one of the five stories, which then begins to unfold only to end up in a problem you need to solve. You can choose the character you feel represents you the most and even give your own name for it. These problems are easily enough solved, as all you need to do is find an object or a person somewhere, bring them to the fairy tale starting point and see things go further. To complicate things further, the story hits another snafu, which you again have to solve in order to see the ending of the tale. And that's that, really. After you have finished all of the fairy tales, you get a final task of finding the magical tale book of Bookwyrm, as Bookend has gone and stolen it. This isn't some heroic quest either, as you just have to waltz down to his hideout and then watch how the ending rolls up and everyone lives happily ever after. The fairy tales you need to complete in the game are Jack and the Beanstalk, Cinderella, Snow White, the Sleeping Beauty and the Bremen Town Musicians. While the stories are or at least should be familiar to most people, it would have been nice to see a bit longer versions of them rather the footnotes offered in the game. Sierra's art and animation quality would have been more than enough to make longer renditions of the stories and that would have really elevated the overall quality of the game. The map of the world. You can't use it to speed travel, but it does show your location in the game world. As the game is meant to be played by younger kids, its user interface is largely simplified. You only have two icons, one for use and another for looking. And out of those two, only use icon is largely useful, the look function just gives you some extra lines here and there. 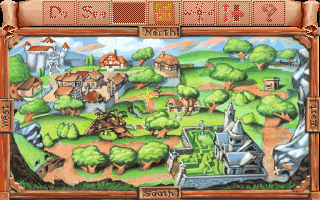 As such, Mixed Up Fairy Tales is somewhat of a disappointing game, especially in comparison to Mother Goose. 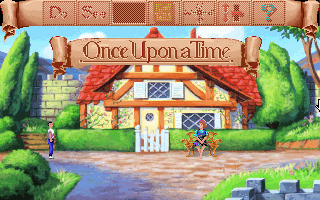 While the game has nice and colourful graphics, it does feel somewhat lacking in content, as it has only 5 fairy tales and all of them are narrated through very quickly with only main points of each story. Another disappointing thing is the music, which consists of bland renditions of well known classical titles. Nice graphics aside, the world of Fairy Tales feels pretty barren as well, as there is very little background animation or characters. All in all, the game feels very much like it was done under a tight schedule and budget. It is something that could have been much better than it is, but now it is just a short, rather uninspiring trip to the world of fairy tales. A story begins. The game often uses the name you gave to your character in the beginning, so that is a nice touch as well, especially when you are talking to the inhabitants of the world, who then address you by name. To my knowledge, Mixed Up Fairy Tales isn's currently sold anywhere. While I can't really lament about it, I guess it could be nice to see it in offer somewhere. While it isn't the greatest game made for kids, thanks to its somewhat sparse content, I can see it at least interesting enough to warrant one playthrough for a kid of right age.